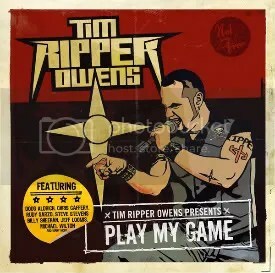 This is the debut solo album from ex-Judas Priest/ex-Iced Earth/current Yngwie Malmsteen vocalist Tim “Ripper” Owens and it’s a grower. On my initial casual listens, I wasn’t too impressed with it, but the more I listen to it, the more I’m liking it. It’s not an essential 2009 release, but it’s good and I recommend it to anyone who is a fan of Ripper. Unfortunately, the sales on the album haven’t been too well. Not that I expected this album to get anywhere near Billboard’s top 100, but I figured it would sell a bit more than the reported 827 copies it sold in the first week of release. Ouch. Oh well, be proud, Ripper! You delivered a solid album. Hopefully, this will lead to even more down the line because I never understood why, after Priest, Ripper didn’t immediately fly solo. The closest he’s come to that is forming the band Beyond Fear, but I think just using his own name would’ve been more marketable (though apparently that’s not true anymore…). I haven’t followed Owens’ career post-Priest, but to me, quite a number of these songs (“Starting Over” and “Believe” for example) sound like what he may have sung while keeping the seat warm for Rob Halford. “Play My Game” is my favorite track and it’s a pretty good tune to workout to.